If you look carefully you can see evidence of lop-sided cake being eaten with every sign of enjoyment, by Michelle Shine, Nathan Good and Richard Smyth who all have stories in Lovers’ Lies, plus James Smyth (London Lies) and Rebecca Payne (forthcoming Fantasy/SF anthology provisionally entitled Weird Lies) Richard and James both have stories in Weird Lies too. 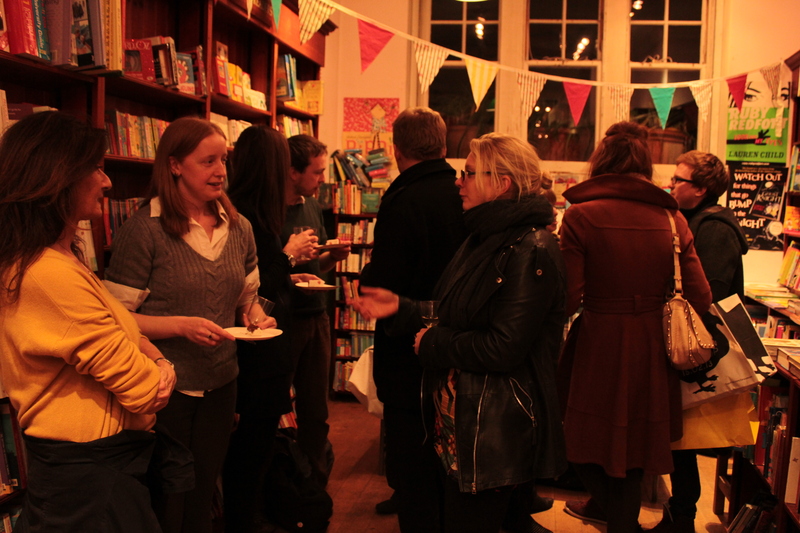 Thanks to Pippa and Sarah at Daunt Books for hosting, to the authors for turning out on a Monday night and to everyone who bought copies of the book! This entry was posted in Events, short stories and tagged Daunt Books, James Smyth, London Lies, Lovers' Lies, Michelle Shine, Nathan Good, Rebecca Payne, Richard Smyth, Weird Lies by Cherry Potts. Bookmark the permalink.